Soak clams for 30 minutes in cold water with 1 tablespoon of salt. Rinse clams thoroughly under cold water and drain. Heat ¼ cup of olive oil in a large sauté pan. Add garlic and sauté until light golden. Add the clams, white wine and the bay leaf. Cover and cook until the clams open. Discard the bay leaf. Add the tomatoes to another large skillet and bring the tomatoes to a boil. Add the clam mixture, with half of the shells including their juice. Add the red pepper flakes. 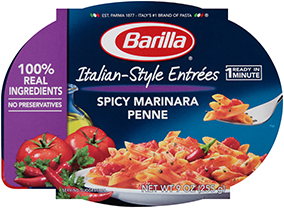 Cook pasta one minute less package directions. Drain and add to sauté pan. Toss with the sauce for one minute. Garnish with chopped Italian parsley and the remaining olive oil.